Working longer hours is rarely the answer for improving performance. This gets people exhausted, disengaged and sick. Instead focus on renewing your personal energy by adapting rituals that replenish physical, emotional and mental resilience. >> When an unsettling situation occurs, consider it through a longer lens. Ask, "How will I view this situation in six months?" Then ask, "How can I grow and learn from this situation?" "Success in the knowledge economy comes to those who know themselves--their strengths, their values, and how they best perform." To discover your strengths, do feedback analysis. Whenever you make a key decision or take a key action, write down what you predict will happen. Six months to a year later, compare the actual results with your prediction. This will show you the following things: your strengths, what you are doing or not doing that prohibits you from enjoying the benefits of your strengths, what you're not that great at, and what you have no strengths in. 5) Don't take jobs or assignments in areas where you have no strength. "Yes, I will do that. But this is the way I should be doing it, this is the way it should be structured, and this is the way the relationship should be. These are the kind of results you should expect from me, because this is who I am." A fair question to ask of other knowledge workers: "What do I need to know about your strengths, how you perform, your values, and your proposed contribution?" It turns out it can actually be a challenge to be truly thankful. We Westerners are brought up to take pride in being self-reliant and independent--so much so that it sometimes becomes difficult to say "thank you" when someone else performs an unsolicited, unexpected, authentic and selfless act of kindness. Rather than be truly appreciative of and celebrate that person's generosity, we find ourselves guilt-tripped into doing something equally generous out of a sense of obligation, Hammurabi's "eye for an eye" principle applied to philanthropy. The irony is that giving out of guilt does not feel satisfying at all. Last night, a 70-year-old man in a suit sitting next to me at the bar at Avec paid for my dinner. Both of us were there alone, looking to have an exceptional meal (it was) on our business stay in Chicago, and soon found ourselves sharing our small plates with each other and with the couple on the other side of him, and exchanging stories about the other incredible meals we've had while traveling the world. When our bills came, he insisted on paying for mine and I relented after a minute or so of protest. Walking back to the hotel still trying to process what had just happened (and realizing that we didn't even know each other's names, having skipped the formal introduction part of a typical first meeting), I was momentarily overcome with guilt. Did I give in too easily? Was he regretting his choice? Should I have given him a hug or a granddaughterly kiss on the cheek to show how moved I was, even if it wouldn't have felt completely genuine? I felt buhao yisi, a Chinese phrase that doesn't have a succinct or accurate translation in English but generally feels like a combination of undeserving, ashamed, appreciative, and touched, all at the same time. A brisk walk in the crisp, cold Chicago evening cleared away all of the negative/doubtful emotions and I convinced myself to simply feel blessed (for lack of a better word with less of a religious connotation), and to appreciate and remember mankind's capacity for giving. 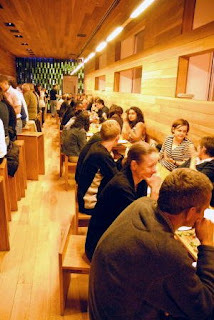 A side note on environment impacting behavior: while other restaurants with more sophisticated or romantic atmospheres that I passed were rather empty and sluggish on a Monday night in a slowing economy, Avec was packed and bustling and couldn't keep a line from forming in its narrow entryway. I'm convinced that it's not just the food that brings people back, but also the sense of community that is fostered by the long bar and long tables where singles and couples are forced to sit elbow-to-elbow with strangers as they enjoy sipping from an impressive selection of imported beer and wine, and savoring the delicious concoctions coming out of the kitchen. It's hard not to want to talk about the food with neighbors when it's so good, and the structure of the restaurant makes these kinds of exchanges easy. During the second presidential debate, which seems like ages ago, the candidates were asked a question that I wish Mr. Obama had answered differently: "What don't you know, and how will you find the answer if you're president?" Mr. Obama responded that they should ask his wife what he doesn't know, and then went on a tangent about what America needs (tax relief, better health care, etc). 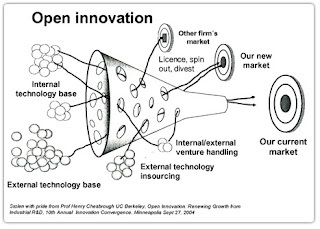 He missed an opportunity to talk about the power of open innovation working in politics. A better answer would have been while he doesn't know which specific types of technology will bring clean power to American homes, he does know that building the right incentives will inspire Americans to invent them. Or while he doesn't know exactly how to get Americans focused on preventive care, he does know that if you give employers and doctors and individuals incentives to prevent illness, America can build a healthier country. Or while he doesn't know what the perfect mass transit system looks like, he does know that if you build the right rewards Americans will develop systems that make us less reliant on foreign oil. These are just a few of the big problems Mr. Obama faces as president. He should not pretend to know precisely how to achieve these goals, nor should he simply pass slow moving and watered down legislation. But he should use his post to structure markets so they point toward goals that transcend politics.